The fake establishment lapdog corporate crony mockingbird mouthpiece dinosaur media has finally learned that no one pays attention to the fake establishment lapdog corporate crony mockingbird mouthpiece dinosaur media anymore. This is humorous, but also worrying. 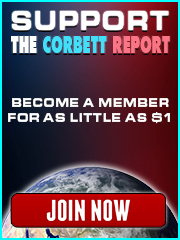 James Corbett discusses what it feels like now that the Eye of Sauron is gazing directly at The Corbett Report in his latest instalment of Financial Survival with Melody Cedarstrom. YouTube soft censorship, Prop or Not, and now MSM Mother Jones. James, you have really made it. Congrats. Every hit piece is much like a “badge of honor”. We often see military dress uniforms decorated with ribbons and medals. Corbett’s T-shirt is gaining quite a collection of ornaments. 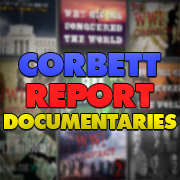 While a general might have 4 or 5 stars, certainly The Corbett Report has 5 stars as an independent, open source, listener-supported, alternative news service. Some of these MSM hit pieces are so ludicrous, so easily refutable, serving to draw attention to the very alternative media sources they attack, that I’m almost prone to wonder if some of them are done by MSM journalists whose consciences have gotten the better of them and are working to undermine their employers from within. That’s actually a really interesting thought. Here’s an idea: Have a female speaker re-narrate Century of Enslavement and post it under the moniker “History of Money Fascism” or “Racist Bankers and Monetary Hate Crimes” or some such jumble of relevant, virtue signaling trigger words. Could this be applied on a larger scale? Duplicate existing work and simply replace the narration and vocabulary with voices and language that appeal to different specific subgroups outside the truth movement, renaming them with titular buzzwords that work with the outrage programming to create idea funnels, all while keeping the core information intact, linking to the source material in all variants? If we all did this, flooded the tubeshpere with countless modified copies of truth media under the guise of state propaganda, couched in their own language, how would the censorbots respond? Could this help to short circuit the outrage and censorship mechanisms? Or at least help to funnel people within our individual spheres of influence from the outrage to a more fact based mindset? This is obviously slippery territory, and I can’t tell if it’s a good idea or not. What do you think? Would such phenomena be effective, or simply increase the intensity of censorship efforts? Interesting idea if implemented rigorously. We already have an informal version of this whenever someone ‘steals’ another person’s work (or portion of it) and just throws a new title onto the video. Perhaps it could be best implemented by just a few savvy individuals who know how to tweak titles to target all the right groups. If it is carried out, I sure hope the original authors are credited as such and retain full rights to their work. Yes, rigorous and consistent implementation would be key. This would be a massive (though not insurmountable) undertaking for a small crew. Obviously a larger community participation would disperse that workload, and perhaps create a more dynamic filter subverting mechanism. I agree, content attribution is one of the slippery parts. How to conduct such an operation and not detract from creators? Since the idea would focus on groups and individuals who would otherwise not consume or be driven away from this media, I don’t know how much detraction would be going on. If done correctly, we could have some breadcrumb trail situation leading back to the source material, theoretically driving more traffic to content originators in the long run. That would be one of the main points of the exercise, direct awareness to truth media outlets. The other being to subvert and confuse the very censorship algorithms which are actively diverting potential viewers. Hopefully blockchain will hurry up and revolutionize content attribution already. At any rate it was very funny! …outmarket the slave marketers using their own emotionally charged spin vocab…I like it… Let’s Wag their damn dog! It can then be made clear that the only way to neutralize the problem is to migrate to platforms where there are no censorship mechanisms to be gamed. Pair that with an examination of the question, “what produces more extremism; censorship, or monetization?” From here, one may argue that extremism is purely a byproduct of censorship and the suppression of ideas. Compare the results of man-made religion (the crusades, literally any terrible human activity you can think of,) to the agora, i.e. a general increase in the quality of life and sentient choice. It may be noted that the evils of ‘modern capitalism’ find their genesis in the historical monetization of extremism, and is therefore itself the product of a censorship dating back thousands of years, a sort of technology initiated by the first group of peoples to forcibly restrict the resources and actions of another. As for more immediate results we could think of who would and would not become aware of the true nature of such a ploy, and within that who would be enticed or repelled by a given video or vocabulary. If they are unaware and enticed by the language, then they are exposed to the truth and source material with a positive correlation, footing for the facts, so to speak. If they are unaware and repelled by the language, those particular buzzwords may lose their efficacy. If they become aware and are repelled by the scheme, perhaps this will cause them to distrust and further analyze such trigger-laden phrasing in the future. If they become aware and are enticed by the scheme, well then great. Aside from altering existing content, creators could also use this idea as a framework for original projects. I’m sure this is being implemented to some extent. It’s kind of a stinky trick but it makes me smile. Yeah, but what platforms aren’t censored? I mean, I was looking at Luke Rudkowksi’s Parkland vid and it doesn’t even work. The twirly thing twirls about but the vid never plays. I tried emailing him about it and got no reply. Then my own minds account has not had ANY new views in weeks. The videos seem to work, but the view count has been frozen. I am not saying that I should have many views, but they are completely frozen. And with me posting the links here there had to have been a least a few people that stumbled across them. Then I have had complaints that the video on my bitchute video doesn’t work, although the audio does. And I cannot find my accounts or videos in a search on either site. So, is there any platform that is not censored? THAT is the question. Here are the links of the vids I put up if you want to see for yourself. Here it is on minds.com if the above link doesn’t work. Some have complained that only the audio plays in the bitchute link. Huh, funny, if you go to Minds.com and type in “mass shooting” (without the quotation marks), my videos, linked above, are the first to show up. That is odd considering that the view counts have not budged. The first time I searched for them I had not clicked on the videos tab. lol, this is priceless. I genuinely want to give it a try. Might be good for people who want to elevate their involvement to the next level but aren’t quite ready or inclined to produce video content themselves. I’m on it man. This idea’s too good to not give it a try (assuming my anon ThemTube accounts are still active). I liked this one “Racist Bankers and Monetary Hate Crimes”. Me too, it’s completely accurate. Pretty much any combination of “hate, lies and theft” would be true, regardless of how sensational. If the so called “elites” (they are not elites, they are thieving psychopaths) did off McShame I would have to revisit my negative opinion of them. But in all seriousness, McShame was a class A Zionist puppet, not something that the psychopathic scum would wish to rid them selves of, quite to the contrary. More likely the cognitive dissonance between the actions of McShame and that of a actual human were so great his brain exploded. He is in the deepest pits of hell. And there is no reason not to include the statement regarding Jewish bankers, that would certainly not be in error. Generally the the manifesto wants to forbid people to be intelligent and to make up their own minds. OBEY! You really hit the nail on the head with this one. I personally became so disgusted with a certain Canadian ‘Dinasaur Medium’s blatant censorship of comments a year ago that I have permanently relegated it to the dust bin. Melody, once again, cautiously attempts to lure James into the pro-Trump, anti-“liberal” bubble that so many of her listeners reside in. James cleverly counters with a reminder that Trump is chairing a U.N. security council meeting with essentially zero negative response, even though Obama was thoroughly bashed for doing the same thing. – Take sides with Russia and Iran, or, at least adopt a neutral position with regards to any Syrian offensive against Idlib, exactly as it did during the autumn 2016 battle of Aleppo. I will spam this again as I have no other way to get it out. And I think youtube would pull it down even if I did manage to upload it. This video is about the Parkland shooting. It has the video of the student who claimed 1 shooter was coming in from 1 entrance, and that when they ran to the other entrance another shooter came through that entrance. This proves that there was more than 1 shooter. It also has large screenshots of the David Hogg mugshots, and the audio of the closet interview where Hogg says that it is 9:32 which shows the video was recorded 5 hours before the event and many other interesting things. Please spread this video and share it with everyone you know. Oh, this should be interesting to all of you. There are two ways to cover up the truth. One is to lie. The second is to tell the truth through a discredited source. A discredited alternative media unfortunately serves an insidious useful purpose for the propagandists. One variant of this phenomenon is that Trump is now the mascot, in the eyes of much of the world, of the “climate skeptics” who do not believe humans are causeing global warming (though many if not most people believe that “climate skeptics” believe there is no global warming). Independent Israeli TV reporter says 200 US and UK military “advisors” to ISIL (oops!) are trapped in Idlib, and NATO ally Turkey won’t grant them safe passage out. Russia warning US to get them out to avoid US-Russian military confrontation. oo la la …have to take a closer look at this asap… now back to class! I’ve had time now to think about the big picture of the dinosaur media. As a propaganda tool , this group (here, now) is aware of the agenda. That agenda, to me, seems to be driving us like cattle to the railhead. Much like the old TV western ” Raw Hide”. We all know who profited from and what the destinations for the cattle will be. For the cattle, they are ” no longer in Kansas “. We have believed the media as ” truth sayers “, the protectors of the Republic. However we, the awakening masses know them as the defenders of ” democracy”. Ruled by the Mob. Just as the Bilderburgs and the Royal Institute of International Affairs have so created, as confirmed by Caroll Quigley’s book The Anglo-American Establishment. What now for the media? The best counter- intelligent move now that all credibility has been destroyed by the PTSB, and the populaces are wary and off balance, would be to let go, have no more need or expense in controlling the narratives. Let it return to its sanctimonious mission of the forth branch of government. No one will believe in the message, mission or purpose. Chaos of the mind. Or change the name, venue, format and let it run wild confusing and debilitating the real goal of the invested Republic reporter. Time will tell. They love to mock and keep you profane of balance.